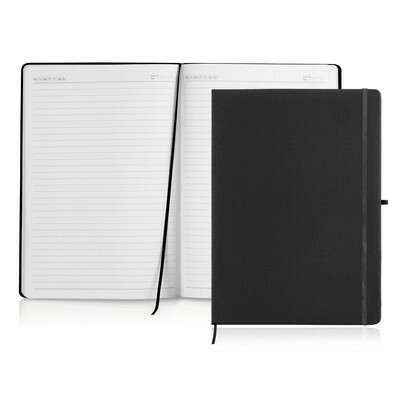 Description: Just like your favourite coffee cup, a great journal is a joy to use over and over again. With handy features like a Penloop, ribbon bookmark, and elastic strap closure, your client`s logo will be positioned perfectly on the PU cover of this prized and practical item, to be seen and remembered daily. The FSC certified, lined pages are abundant so to maximise your client`s return on investment. Commodious A4 size. Colours: Black. Decoration Method: Pad Print, Digital Print.